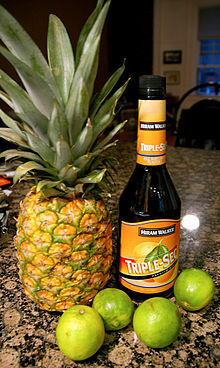 Triple sec, originally Curaçao triple sec, is a type of strong, sweet and colorless orange-flavored liqueur. It is a variety of Curaçao liqueur, an orange-flavored liqueur made from the dried peels of bitter and sweet oranges. The etymology of "triple sec" is unclear. "Sec" is the French word for dry. Triple sec may refer to the schnapps being distilled three times, having triple the flavor, being three times as dry as other spirits, or it could just be a marketing gimmick. Triple sec may be consumed neat as a digestif, or on the rocks. However, it is more typically used as an ingredient in a variety of cocktails, such as sangria, margarita, Kamikaze, White Lady, Long Island Iced Tea, Sidecar, Skittle Bomb, Corpse Reviver #2 and Cosmopolitan. The Combier distillery claims that triple sec was invented in 1834 by Jean-Baptiste Combier in Saumur, France. However, the Combier distillery was more famous for its élixir Combier, which contained orange but also many other flavorings. According to Cointreau, its orange liqueur was created in 1849. Triple sec was certainly widely known by 1878; at the Exposition Universelle of 1878 in Paris, several distillers were offering "Curaço [sic] triple sec", as well as "Curaço doux". ^ "Triple Sec". Bar None Drinks. Retrieved 30 July 2018. ^ a b English, Camper. "Orange You Glad You Know This?". Fine Cooking. Retrieved 5 July 2018. ^ Dietsch, Michael. "The Serious Eats Field Guide to Orange Liqueur". Serious Eats. Retrieved 5 July 2018. ^ a b "Cointreau". Rémy Cointreau. Retrieved 30 July 2018. ^ "Original Combier". Combier. Retrieved 31 July 2018. ^ "Les liquoristes saumurois" in Saumur jadis, anonymous Web publication at  cites Richard Gasnier, Les liquoristes saumurois de 1830 à 1910, mém. de maîtrise, Angers, 2000, B. U. de l'U.C.O., 15 747 ; François Bouyssi et Isabelle Emeriau, "James Combier (1842–1917 ). Essai biographique...", S.L.S.A.S.,, 1992, pp. 46–89 ; Alain Mariez, "Un zeste d'orange, deux doigts d'ambition", L'Anjou, décembre 1995, pp. 70–77 ; Christelle Couvreux, Marie Bardisa, La Distillerie Combier. Saumur, Itinéraires du Patrimoine, 1999. ^ The Lancet Analytical Commission, "Report on the Food Products exhibited in the French and English Departments of the Universal Exhibition of Paris", The Lancet, September 21, 1878, p. 417f. This page was last edited on 16 February 2019, at 03:40 (UTC).